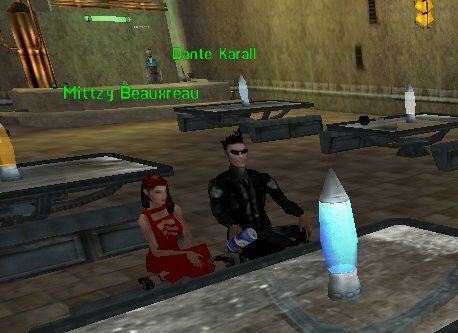 This past April 15th, after 2 hours of the first meet at greet for Mayor in Borealis where the candidates presented themselves and shared their background with the audience I managed to get an exclusive interview with Miss &quot;Mittzy&quot; Beauxreau and her campaign manager Mr. Dante &quot;Karall&quot;. Neutrals may remember Mr. &quot;Karall&quot; since he ran for Mayor of Newland 6 months ago and was second place with 27% of Newland votes which was more than double the combined votes of the two candidates behind him. 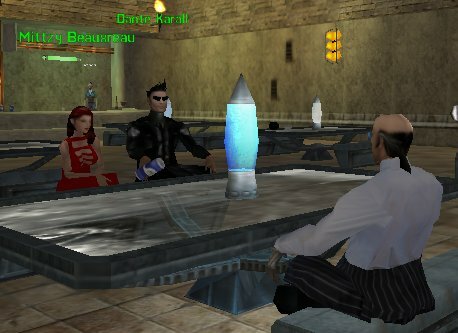 The interview took place in one of the less crowded Borealis shops in the entertainment room below the trade supplies room. Noticiero: Thank you for meeting me, this is a more friendly atmosphere. Mittzy: Yea, it is, thank you. Karall: Oh, hey, no problem dude. Mind if I ask who you write for? Noticiero: Miss Mittzy, I assume you are single? I'm sure some neutrals would love to know if you are. Mittzy: Dante's not just my manager. He's my boyfriend. Karall: Mittzy and I met during my own campaign for the Newland mayor's seat. She's been my main squeeze ever since. Noticiero: That explains it, you were a popular candidate Mr. Karall, do you think your girlfriend will be able to use the same charm you used during your own campaign? Karall: I think that she stands on her own merits, really, 'cause she's a *totally* righteous babe. But, like, at the same time, with the two of us working together... what could go wrong? Karall: I wouldn't say I was really *popular*... but if people liked me, hopefully they'll appreciate someone that I'm putting my own faith in. Noticiero: Miss Mittzy, other candidates seem to be better qualified, with political and military backgrounds. Do you feel that you're the underdog in the race for Mayor? Mittzy: Underdog? I may be less qualified, but what does one need to be qualified for Mayor? Aren't we here for the people? I am one of the people. I'm just as qualified as the rest of them. I know what would be good for Borealis, that's what's important. Karall: I think, in the long run, it's more important to focus on who has the better ideas in the present, not who has a better resume. Noticiero: You do have a good point. Noticiero: Sometimes a leader needs more than a good weapon and armor, a strong heart is needed. Noticiero: Do you feel you have the strength to lead the citizens of this town in the current turmoil? a neutral citizen was recently arrested by Omni-Pol just for speaking to a member of the NLF. Mittzy: I have the strength to show people that we can be strong to stand up to the Omni. No more letting them push us around. We will be strong and show them that we are our own independent people. Karall: One thing that everyone has to realize is that, like, a city is only as strong as the community that backs it up. So while yes, my candidate would be in a leadership position, it would be up to the citizens of the city to ultimately choose their destiny. There's only so much a leader can do to protect against that kind of stuff if the populace doesn't back it up. Noticiero: Do you have a plan for Borealis if you are win the election? Mittzy: Do I have a plan? No. Mittzy: I have Lots of plans! Mittzy: There are so many things that we can do to better this city. Noticiero: Ah, so if you were mayor, what would you do first? Mittzy: I mean, where to begin. First I believe we need a strong militia, but not just for Borealis for all Neutral cities. Then we should strengthen our economy. More shops, more restaurants. Making this city more plesurable and enjoyable. More comfortable, with clubs and bars. Mittzy: We're open to all. Mittzy: I think that would strengthen not only our economy, but the economy of the entire planet. Noticiero: Good ideas, similar to the ones other candidates have proposed, which will certainly make the choice harder to make. Mittzy: Indeed, I think this election will be a close race. Noticiero: Do you think you have any advantage over the other candidates? Mittzy: It's hard to tell after this first meeting. It will be interesting to see how it plays out. However, whatever the results are, Borealis will only become a stronger and more powerful city. That's what's important. Noticiero: Do you have any financial backers in your campaign or are you using only your own funds? Noticiero: You were an entertainer Miss Mittzy? A singer perhaps? Karall: I dunno, babe… Did you ever, like, sing? Mittzy: I sing in the shower, does that count? Mittzy: I'm not ashamed, Dante. Noticiero: So what sort of entertainment did you do Miss Mittzy? Karall: She's a very, uh... talented dancer. Noticiero: I see, the exotic kind? Mittzy: I do all kinds, but yes, the exotic kind too. Karall: Dude, she can shake it like ain't nobody's business, yo. Noticiero: Nothing wrong with that, it's a legitimate job. Noticiero: I assume you met during a performance? Mittzy: I'm not ashamed. i made a lot of creds, and helped my family. Karall: Sure did. I was out partying with my boys after one of the Newland meetings, and it was totally love at first sight. Noticiero: Love blooms where there are open hearts my mother used to say, looks like you are a perfect example. Karall: Well, we'd like to think so. Karall smiles brightly and reaches out for Mittzy's hand. Noticiero: I'm just a clan reporter, no voice in the election, but I believe you have your heart in the right place for Borealis. Mittzy takes his hand and gives it a squeeze. Karall: Well, we're glad to know that you think so, dude. It'll be a long race, but I have faith in my candidate. Noticiero: Is there anything you would like to tell your fellow neutrals, many will be reading this interview. Mittzy: Well I would just like everyone to know that their voice can be heard, no matter how small. We need everyone to come out and vote. Not to be afraid, every vote counts. Even if it's not for me. Karall: I'd like to add in that even though I know there are peeps out there who may be put off that people like Mittzy or myself don't have the long resumes or really impressive backgrounds or anything... that we're good people, who want to do what's right. I just encourage everyone to listen to the issues, and vote with their heart. Mittzy: It was a pleasure meeting you. Karall: Been a pleasure, bro. Look forward to reading the interview. Noticiero: I wish you good luck to you both. Mittzy: I really look forward to reading it. Karall: Thanks dude. Take care, aright? Mittzy: Hope to see you at the next meeting. Karall: Shall we head home, babe? Karall: Remember: Don't be ditzy, vote for Mittzy!! As I said during the interview, I'm a clan reporter and my voice does not count in the Borealis elections for Mayor. However I have a good feeling about Miss &quot;Mittzy&quot; and her campaign manager's good intentions for Borealis. They certainly have tough opposition. It will be up to neutrals to decide who is more qualified and able to do their best for their town.